I was so thrilled when one of the Rubicon Press editors told me over the weekend that my chapbook, Secret Love Poems is ready to go to print this week. The cover art is by Oana Cambrea — who's been so kind to give us permission to use her image. Her works are simply divine! • Am scheduled to make my 13th appearance in Eclectica with a word challenge poem, The heart stops momentarily — and a sonnenizio on a line from Ros Barber, Aftermath. • CommonLine Project accepted a rather ticklish fetish poem, Necks for Issue 011 (due out on November 1st). • Will also have two poems, Liu Song Warms Himself By the Fire and Six Reasons I Never Write About Home in the debut issue (Fall/Winter 207) of Cha: An Asian Literary Journal. It's new, but has nice professional manners. Quickish response times, too. They're considering work from or about Asia, check them out. ... after her birthday, A had a bit too much wine in the country and fell off the 30:30 wagon. A crawled out of her hangover and has gone back to square one (Round 9). A has sworn to anyone who would listen that she is never going to touch another drop of liquor. Ever again. That said, A is pleased to finally announce that Issue 2 of Press 1 is now up and running — with works by FJ Bergmann, CL Bledsoe, Benjamin Buchholz, Leonard Gontarek, Janna Layton, Dennis Moritz, Andrew Mossin, Mark Sutz, John Vick and Ann Walters. All photography in this issue is courtesy of Jill Burhans. • Convergence accepted my poem, Laguna Palace, Mestre for their Fall/Winter issue. This is a neat little 'zine that started out in 2003 — discovered it while jumping from link to link and had a great time going through their archives. Fairly quick response times, too. It sure helped light up my cake! • Cahoots Magazine accepted an oldish and previously published poem, After the Affair for an upcoming issue. Their response time (see below) is rather long. However, they seem to be moving towards getting out of print and going solely on-line — which might lessen the waiting period. Thank you for your submission. Although we can't comment on each manuscript, we can at least spare you the platitudes (your writing is impressive) and salesmanship (have you seen the magazine?) of the condescendi. So. Isn't that wonderfully cheeky? I had to blink three times (quite shocked, of course) before I believed it and did some witchy jumps of joy in the kitchen. • Mimesis, another print journal, accepted four poems, A Driving Student Enters the Roundabout, Battery Park City, Locusts and Cordon Bleu for their 3rd issue. Yay! I'm doubly thrilled because this is such a gorgeous-looking journal. Contrary to UR-VOX, they seem to accept submissions only via e-mail. Quick-ish response times, too! Just received word from the editor of Radiant Turnstile that he has submitted my poem, Mrs. D's Last Letter to Her Son (July 2007 issue) to the Pushcart Committee. WOWZA. I'm so honored... I feel I should hide behind the sofa until chased out by the dust bunnies and spiders. I'm floating happily enough to say that Thieves Jargon has been resurrected. 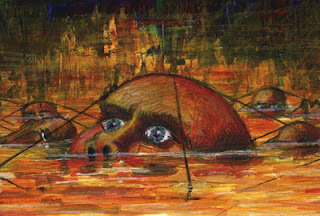 Issue 152 has now gone up, with my poem, Fishing dead bodies in water. You've got to be dead not to love this artwork by Stephen Elvidge featured there. Have got a ticklish poem, Please Meet My Table up in the ever tickling 'zine, Zygote in my Coffee (Issue #93). What else? Today is Day 5 of 30. I am in pain. In another two days, I won't only be in greater pain — I'd be older, too. It's official. Have written my first poem in two months and posted it in 30:30. Its birthing was quite comparable to a tooth abscess. Am running ever so late with correspondence and blog lives, but I do want to say thanks and a huge HI!! to those who left messages in my previous posts. I will catch up with everyone's blog. Eventually. Am delighted to announce that I've finished Jayne Pupek's website. She's a brilliant poet/writer... but more importantly, she knows her drinks. At some point during the construction, we lost quite a bit of attachments and e-mails between us while drinking to each other's health. What else? The original photographer whose work we were supposed to use at the site stopped communicating with us. One of us suffered from double vision caused, in part, by looking at naked mannequins while the other began seeing ketchup on the back of fallen angels. Er. Um. Hic. Yes. • alice blue accepted three poems — one: placebo, two: union and four: totem — from my approximative translations manuscript (unfinished). Yay!! Am so thrilled because (1) I adore this 'zine, (2) it publishes innovative, experimental work — not my "genre" at all, and (3) it's my third try with them. Persistence pays! • Am likely to have my sonnenizio, Breakage in the Summer 2008 issue of Orbis. I say "likely" because the editor offered to read more of mine for the Winter issue. Because publised poets are required to wait at least a year before submitting again, acceptance in the Winter issue will probably wipe out my appearance in the Summer issue. Sounds rather long-winded put that way, but there it is. Response time is a bit long, but the editor is considering work for the Winter issue (mailed in January 2008). If there's a season featured in your poem, make sure it's winter. Breakage is more of a summer poem, hence the wait. I didn't know about this before I submitted. Thought it might be useful and interesting for others to know. • Was very honored and thrilled to receive an e-mail from Snow*Vigate Press saying that my poem, In the Woods—A Shot—Fraught with Barking Dogs which was published in Blue Fifth Review will be included in their anthology, Online Writing: the Best of the First Ten Years (edited by Kim Chinquee and Doug Martin). They're shooting for 100 writers to include and hope to have the book out by Christmas. WOWZA. • Am thrilled to know that the anthology edited by Holly Hughes, Beyond Forgetting: Poetry and Prose about Alzheimer’s Disease (Kent State University Press) is pushing through with publication in late 2008. Have signed another contract for the reprint of my poem, Five Minutes of Silence. • Really thrilled to received my copy of ANON (#5). This is one of the most beautiful print journals I've seen — with a terrific array of poetry and prose inside. • Was ecstatic to receive my copy of Staple Magazine. It's absolutely gorgeous! I was expecting it to be saddle-stitched with a card cover... so it was quite a surprise. The £10 check is a cool sight, too — not that I can cash it in Italy. Anyway, the table of contents, with some of my fave poets, is viewable here.